Jason Bourne: I don't have a choice! After discovering his identity as a trained and programmed CIA assassin, Jason Bourne (Matt Damon) has retired to obscurity in India with his stunning love Marie (Franka Potente), who tries to help him excise the demons. Before this activity is complete, an unknown assailant (Karl Urban) attempts to kill Bourne, which brings the superspy out of hiding to unlock the mysteries of his enemies. Meanwhile, a CIA task force led by Pamela Landy (Joan Allen) has organized a sting operation to gain clues towards an unsolved murder. When their agents are murdered, the evidence points to Bourne as the killer. Who is trying to frame Bourne, and can he escape almost-certain death again? 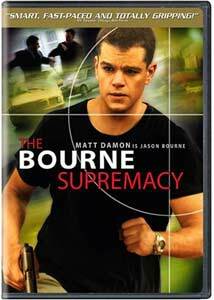 The Bourne Supremacy occurs two years following the events of the previous film and once again provides an intelligent, gripping spy thriller. Unlike the wise-cracking and arrogant heroes of many action pictures, Bourne wants no part of this life and is serious about his violent actions. However, he possesses talents held by few others in this world, and his knowledge of past operations makes him a threat to certain authority figures. One of these concerned individuals is Ward Abbott (Brian Cox), former supervisor of Treadstone, the project that trained Bourne. Working with Landy�s team and his right-hand man Danny Zorn (Gabriel Mann), Abbott tracks our hero around Berlin and tries to catch him. Urban's assassin also returns for a crazy chase through the streets of Moscow that appears destined to end Bourne's existence. Doug Liman (Go, Swingers) helmed the series' first entry—The Bourne Identity—which provided an energetic, stylish journey in search of the lead character's past life. It included several engaging action sequences, including an inventive chase within a very small car, but mostly involved brains over brawn. Paul Greengrass (Bloody Sunday) takes over as director for this picture and cranks up the action to a feverish pitch. The final chase scene is much-more elaborate, and a hand-to-hand fight scene is especially brutal. Greengrass retains the stylish atmosphere, but he makes the tone more intimate and realistic. The often hand-held cameras cut quickly during the action scenes and create an intense, disconcerting feeling. Writer Tony Gilroy penned the first screenplay, and his return for the sequel helps to bridge the story and retain the personal elements. Even though this entry utilizes more action, Bourne's goal is still the search for his humanity while haunted by the murderous deeds of his past. Matt Damon is generally not recognized as a superb actor by critics and audiences, but he has delivered two solid performances and brings an adult sensibility to the Bourne character. He never overdoes the emotional moments and makes his character's brilliant activities completely believable. Joan Allen (The Contender, Nixon) also brings considerable credibility to the story as Bourne's pursuer, and Landy's motivations are always understandable. Brian Cox can play this type of smarmy figure in his sleep, and his return also nicely connects to the first film. Julia Stiles appears again as Nicky, the agent who worked on Bourne�s file. When a third picture is likely produced, it seems possible she'll play a larger role. The Lord of the Rings series' Karl Urban also does top-notch work as Bourne�s primary physical opponent even while given little dialogue. Although it basically functions as a genre film, The Bourne Supremacy stands out because action films continue to become dumber and more ridiculous. While this picture's considerable success might be owed to its concluding chase sequence, it also stems from a more-mature treatment of the material. Even the purpose of this action is much-different, as Bourne's goal is to apologize to a former victim. He is not seeking money, power, or other typical aspirations, but aims to resolve the troubles of his past. This dilemma improves the fight scenes and places more importance on Bourne's ultimate survival. These alterations to the basic formula enhance our investment in the character's fate, which leads to an intriguing viewing experience. Image Transfer Review: The Bourne Supremacy includes plenty of exciting visual moments, but they the quick-cutting style can be difficult to discern on the small screen, especially on normal-size television sets. However, this difficult should not lessen the grade of this top-notch 2.35:1 anamorphic widescreen transfer, which includes bright colors and no significant defects. Many of the scenes occur at night, which could lead to grainy scenes, but that is not the case with this impressive transfer. Audio Transfer Review: This disc offers a powerful 5.1-channel Dolby Digital transfer that presents the explosions and kinetic chase scenes in all their glory. The effects and music move well throughout the sound field and deliver an effective listening experience. John Powell's score is especially impressive and really jumps from the speakers. It would have been nice to have a DTS transfer option, but this track is definitely a worthy offering. Director Paul Greengrass begins by discussing Matt Damon and his underrated talents. We also learn about the contributions of Brian Cox, Joan Allen, and Karl Urban to this entry. This feature provides a few brief interviews, but includes too many unnecessary film clips. This piece covers the film's style, as Greengrass and the crew attempted to craft a realistic, immediate atmosphere. He aimed for the "unconsidered" world, and often neglected to do rehearsals. This material is moderately interesting, but they needed more than five minutes to present a definitive look. This worthy featurette provides a quick overview of preparations for the house explosion. It surprised me to learn that they utilized no digital effects to generate this moment. The scene took four days to shoot, and it was accomplished in one take. Another unique aspect was the location shooting that took the place of the typical matte paintings and visual effects. This interesting piece covers the production in Berlin, Moscow, and Goa, India and gives a brief description of each setting. Notwithstanding the silly title, this featurette does offer a few notable insights about the fight scene between Bourne and the last Treadstone agent. Damon conducted all of his own stunts in the film, which makes the end result more impressive. We also see a decent amount of behind-the-scenes footage presenting the fight construction. The best entries on this disc involve the innovations utilized to capture the crazy chase scene through the streets of Moscow. The crew placed cameras inside the car to enhance the "you-are-there" feeling. The number of cars required to coordinate this sequence is remarkable. Connecting to the previous feature, this seven-minute showcases a strange rocket-like vehicle that also increased the chase's intensity. It pulls the actual taxi at quick speeds and helps to place audiences right with Bourne. Damon enjoyed using this technique, as it kept him from having to act against a green screen. This basic overview is not an episode of the acclaimed television series. Instead, it's simply a four-minute look at the scene where Damon jumps off the bridge onto a moving barge. The producers strived to raise the bar from the first picture, and this action represents another example. Composer John Powell utilized a large orchestra to generate the score for this film, and he discusses how they tried to make the music roll with the story. He tried to correlate his score with the original theme and to focus on the pivotal scenes early in the movie. Paul Greengrass is a talented director and did a great job creating this sequel, but he does not provide a very interesting commentary. Too much of his comments is silly plot summary that is obvious to anyone paying attention to the film. Greengrass obviously cares a lot about the movie and seems interested, but the information presented adds little to our understanding. Nothing within these seven minutes of excised footage should be labeled "explosive" as it is on the packaging, but there are a few interesting moments. Three of these scenes are very brief and provide unnecessary plot aspects, but two are lengthier and expand Brian Cox's character a bit. They're noteworthy but offer nothing too different from the finished product. This section provides informative biographies for the seven top actors, the key members of the crew, and author Robert Ludlum. The acting entries also provide extensive filmographies for each figure. The Bourne Surpremacy effectively builds on previous moments and continues the series without any drop-off in quality. This is a rare occurrence for sequels, and indications are good that future pictures might also be successful. This release provides a solid collection of extra features and offers impressive video and audio transfers. It deserves a high recommendation and should please both action fans and viewers who generally avoid the genre.